Izod Impact Strength notched @ 73°F D-256 .75 ft.lb./in. As fittings described in our catalog are built to Harrison specifications, Harrison can also provide systems to SMACNA specifications upon request. The SMACNA manual (Thermoplastics Duct (PVC) Construction Manual), is a good source of information for those involved in the specification and installation of PVC duct systems. Another excellent information resource publication, used extensively by Harrison, is the "Industrial-Ventilation Manual of Recommended Practice". This book covers all phases of designing and sizing of an industrial ventilation system. It is an excellent educational tool. Beyond these two resources, Harrison offers the following recommendations, relative to system installation, based on years of field experience. HARRISON SUPERDUCT® duct systems are easily assembled since they basically consist of fittings that are bell-end to receive plain-end duct, or in the case of plain-end fittings and pipe they are assembled using sleeve couplings. In the case of square and rectangular ductwork systems, these are always either welded together or connected by bolted flanges. Solvent cement is never used. Solvent cement welding is by far the most widely used process for joining PVC pipe & duct. Properly assembled, it is certainly the easiest way to make quality sealed joints. 1. Solvent cementing should not be attempted at temperatures below 40°F or much above 90°F. Joints should not be made in hot, direct sunlight. 2. Remove all burrs and chips from any duct that has been cut. With a clean, dry, cotton rag wipe away any surface contamination on the surfaces that are to be joined. If the surfaces are wet (i.e. condensation), DO NOT ATTTEMPT TO JOIN THEM-they will fail. 3. Using an applicator, approximately half the size of the duct diameter, apply PRIMER. The function of primer, in making quality joints, is to penetrate and soften the hard surfaces of PVC duct. This must be done on BOTH surfaces to be joined. A simple rule of thumb, in checking the adequacy of surface priming, is the ability to scrape a few thousandths of the softened PVC surface. 4. DO NOT ALLOW THE PRIMER TO DRY before applying the solvent. Once the two surfaces to be joined have been fitted together, give the joint a quarter twist (if possible) to thoroughly mix the two solvent reduced surfaces. 5. There are several sources of primer and PVC solvent cement on the market. Before starting an installation, consult with your supplier of primer and solvent cement for advice on the best product to use for your application and work environment. In diameters thru 14", Harrison has found that HARRISON SUPERDUCT® systems can be readily joined via the solvent cement method. Beyond 14", the actual cementing and drying times become so protracted that sections of large duct cannot be maneuvered into position quickly enough to effect a good solvent fusion before the cement hardens and dries. It is our experience that with systems above 14", they should be joined via the hot-air welding method, using PVC welding rod and welding guns available thru Harrison on either a rental or purchase basis. Above 14" diameters, it is Harrison's experience that duct and fitting connections should be hot-air welded using PVC welding rod and welding guns that are available from Harrison. Harrison usually welds each joint using three passes of 5/32" PVC welding rod. Before welding, each joint should be prepared by cleaning the duct & fitting surfaces of any dirt, oil or other contaminant. This will ensure good fusion conditions. Once the duct and belled-end fitting or coupling are securely seated, the fit should be secured by "tacking" the joint with a hot-air welding gun. The process of "tacking" creates a PVC fusion between the two components, holding them in a position for the actual welding. Another benefit of "tacking" is that it seats the gap between the two components, so that during the actual hot-air welding, the PVC welding rod and the two surfaces being joined are adequately heated to the point of a strong weld. If the joints were not first tacked then the hot air from the welding gun would pass through the gap resulting in the surfaces to be welded receiving heat inadequate for fusion with the welding rod. This would result in "cold joints" that are brittle and subject to failure under stress. Maximum distance between vertical supports should be no more than 16 feet. The primary limitation of PVC material is the recommended environmental temperature limit of 140°F (60°C). HARRISON SUPERDUCT® PVC duct pipe and fittings are not intended for underground use. 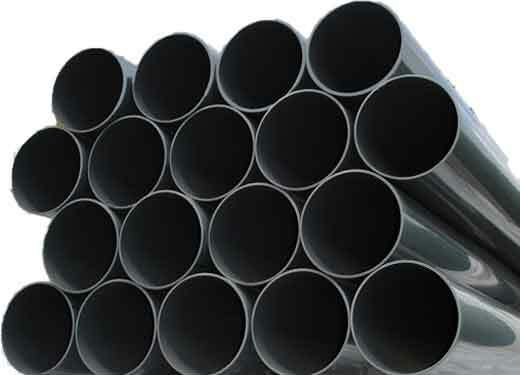 PVC material compounds used in the manufacture of HARRISON SUPERDUCT® PVC pipe and the fabrication of HARRISON SUPERDUCT® fittings shall conform to Type 1 Grade 1 PVC, Cell Class 12454B, as described in ASTM D-1784. Duct diameters thru 20" & 24" will be extruded and of seamless construction. Sizes thru 18" will have a 0.187" wall thickness. 20" diameter will be @ 0.219" and 24" @ 0.250" thickness. Fabricated (heat formed) duct diameters 22" and 26" thru 30" will have a 0.187" wall while 32", 34" and 36" & larger diameters will have a 0.250" wall. Fabricated duct shall consist of a singular buttwelded seam, thermally fused under computer controlled temperature and pressure, without the use of PVC welding/filler rod. All extruded duct shall be furnished in 10 or 20 foot lengths, plain end; fabricated duct will be furnished in standard 4 foot lengths with a coupling attached on one end. Three piece 90° elbows and two piece 45° elbows are considered standard and are furnished with a centerline radius of approximately 1 to 1 1/2 times the duct diameter. Five piece 90° elbows and 3 piece 45° elbows, per SMACNA specifications, can be provided, on specific project requirements. All couplings will be "sleeve" type style having an over-all length of 4 1/2"
All belled end sockets (5" and above) shall have a minimum socket depth of 2" or more. 2", 3", & 4" belled socket depths will be @ 1 3/4". Branch fittings are designed to enter the main duct, at an angle not exceeding 45° Branch 90° tees are available where systems allow. Transition fittings shall have formed corners where practical. They will be of concentric design (unless otherwise requested) with a tapered cone-type body. Reducer couplings having a size reduction greater than "two-step", shall be formed with cone-type body having an overall length generally calculated @ 4" per 1" size reduction, where space allows. One-step and two-step reducers will have a smooth-flow concentric design. Blastgate Dampers shall be furnished with a 3-position locking pin (open, half-open, closed). Butterfly (Balancing) Dampers shall be furnished with a locking quadrant, to permanently position. Motorized dampers are available on request. Rain Caps shall be of "Zero Pressure Loss" design, commonly known as Style "B". Style "A" Rain Caps are also available on request.